In the history of mankind there have been many great thinkers, scientists, philosophers, orators, writers, but none of them have ever possessed such sublime intelligence, such deep knowledge, such ability to clearly and eloquently express their thoughts as the Holy Fathers of the Church. With their great minds the Holy Fathers not only encompassed all the corners of our visible universe, but penetrated into the heavens, and thus explained to us everything that man’s limited mind is able to understand about God and His creation. The Orthodox Church, with all its teachings and all its services, rests on the writings of the Holy Fathers. For the Church they represent a spiritual compass, by which the Church checks the correctness of the course along which it leads its faithful. Among these great pillars of the Church there are three who are commemorated especially: they are the holy hierarchs Basil the Great, Gregory the Theologian and John Chrysostome. Throughout the year, each one of them has his individual feast day, even several a year, but the Church has specifically decreed another special day - February 12th (January 30th, old style) - for their joint commemoration. Why is that? 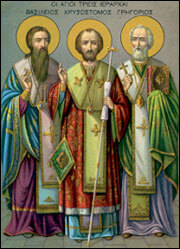 The reason is as follows: at the end of the 11th century, in the city of Constantinople, there was great dissension among the learned theologians of those times, as they argued over which one of the three saints was highest. Some proposed St. Basil the Great, believing him to possess the greatest wisdom in understanding lofty truths and church dogmas, leading the most righteous life and being the strongest fighter against sin and human weakness. Others preferred St. John Chrysostome for his charity, his understanding of human frailty, his compassion, and for his bringing many people to repentance through his eloquent sermons. Still others stood up for St. Gregory the Theologian, considering him to have surpassed all other leading philosophers and orators in the world with his ability to speak so convincingly and to explain the Holy Scriptures so clearly and skillfully. Such arguments and quarrels were highly unprofitable, because in putting forth the merits of their favorite, the adherents of each saint unwittingly denigrated the other two, and caused disruption in church life. The righteous bishop John did everything in accordance with the saints’ wishes, and to this day the Church celebrates the service he composed in honor of the three hierarchs. Let us appeal to these three great saints, and ask them to help us find our way through all the contemporary temptations and heresies, and to live a Christian life amid the iniquity which surrounds us. We now live in a world of increasingly new discoveries in the soulless field of science and technology; we live in a society which tramples upon all that is divine and beautiful, upon all moral values, a society which extols only mankind’s limited achievements, extols evil, ugliness and debauchery. We are bombarded with all kinds of new teachings: the New Agers, ESP healers, charismatics, various “Christian” preachers. How do we find our way through this maze of false Christianity, through all this deviltry? It is here that the three hierarchs can help us, can guide us to salvation with their teachings. Let us appeal to them: to Basil the Great, sage and philosopher, teacher of Christian virtues, writer of the Divine liturgy that is served in the Church ten times a year; to Gregory the Theologian, who attained the most sublime understanding of divine truths, and was the best expounder of Christian dogmas; and to John Chrysostome, whose wondrous liturgy spiritually nourishes us throughout the entire year, who is an example to us of Christian love and charity towards people, and who surpassed all others in the wisdom and eloquence of his sermons: it is for this reason that of all the beautiful and poetic writings in Church literature, it is his unforgettable paschal homily which the Church decreed for all times to be read in the glorious night of the Christ’s Resurrection.